One of the things I like best about Twitter is its built-in brevity. No rambling. Limited nonsense. Perfect for quick info and to-the-point conversations. One-hundred-and-forty characters is enough for me. However, if you use a Twitter client such as TweetDeck, you've now officially been empowered to drone on...and on...and on. In the latest version of TweetDeck (version 0.37), launched this week, the company saw fit to install Deck.ly integration. What that means is that you can tweet beyond that 140 character number and a link will be installed into your tweet directing people to the entire message. Worse yet, the window in which you tweet just lets you go beyond your 140 character limit without making it obvious that you're a chatty cathy. It used to be that the window and text changed color when you went beyond your character count. Now, with the "upgrade", it just puts a tiny "+" sign on the right where your character count is located. One could, very easily, utilize Deck.ly without really realizing it. Talk about annoying. Fortunately, the TweetDeck support site is blowing up today with complaints about the new feature. Users, rightfully so, want the option to turn off Deck.ly without having to worry that it will automatically kick in. TweetDeck reps say they've heard us and are working on a solution. I'm not sure if Deck.ly paid Tweetdeck for this integration, but I'm sure there's some deal and maybe that's causing the delay. Don't upgrade if you haven't done so already. Sound off on the complaint thread HERE. In the meantime, if you use TweetDeck, beware. You may be annoying your followers with lots of Deck.ly links and be talking way more than you intended. Now, get back to tweeting and be safe out there. Heaven help us. One Facebook is MORE than enough! LOL without the character limit you get Facebook...lol....Tweetdeck forgot that Twitter is called MICROblogging...duh! See, that's exactly what I'm saying. Unless you're really paying attention you could miss this, send your tweet, and irk your followers. I hate those Twitlonger links; they drive me nuts. Suffice to say, I'm with you, Rachel. The character limit of Twitter is what makes it appealing. If everyone starts using these services to tweet diatribes instead of brief comments, it destroys the whole concept behind Twitter. But, again, it's about choice. Users like to have choices and not receive mandates from on high. Thanks for adding to the conversation, Rachel! I agree with Steve...the only time I used a link for an extended Tweet...is when I am REtweeting something that I just can't shorten and I want to comment on it. Yeah, lots of different Twitter clients out there. It's a very personal decision, much like selecting a smart phone. I'm with you on the character count, though. Can you imagine if every tweet had a link so that you have to click on it to see the person's complete message? What a nightmare that would be! Makes me shudder just thinking about it. Glad to see you're in the 140 camp, Steven! Thanks for chiming in. I haven't used TweetDeck in a while, for me the main objective for using such tools is organization. Hootsuite works for me because I can create tabs of subjects, inside each tab are related private lists. TweetDeck doesn't fulfill that requirement. 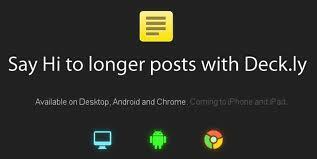 Seesmic Desktop part fulfills it but there is a delay in updating lists, there have also been problems with Linkedin and YouTube as well. I agree that 140 characters is sufficient otherwise it goes beyond what Twitter was designed to do, I have a lot of accounts I follow and if people cannot stick to to the limit I am less likely to read it. If I think one of my tweets is going to worthy enough to retweet by others I write it as such so that there is room for other people to do so. Maybe I am just a control freak, but when I use an application I like to have control over the features., I find it distracting when I have to worry about nit picky details. It is hard enough to have to try and keep up with all the apps if they are not user friendly. I actually like tweetdeck and use it more than going to my twitter webpage. However, I stand up with you on this issue. Yes, there are programs out there that people use to extend their tweets. However, those people choose to use them. With the Tweetdeck upgrade, users have no choice. There is no opt-out or disable. Before, if you wrote more than 140 characters, your tweet wouldn't send. You knew you were saying more than your allotted tweet. However, with the forced Deck.ly integration, you can naively go over and force your users to click a link to see the rest of your thought. Thanks for the counterpoint, Cheri! This reminds me of a few years back (don't remember how many years, as I am older and a couple of strokes later) but microsoft pulled a stunt with including a browser and it ticked a few of us off. I think the browser was netscape. Anyway, that is what this reminds me of. Miss Amber usually I am the first person to cheer you on for a cause but this one isn't such a big deal. With apps already out there like Tweetlonger and Twit~something-or-another people are going over 140 characters all of the time when they want to. With Deck.ly I also see fairly decent size numbers counting how far over in characters a tweet us next to the little +. I know this because in going to RT an item, I hit the edit button on Tweetdeck instead and the tweet was already over 140 characters. All these clients are really just personal preference. I know lots of folks like HootSuite, but I just wasn't wowed by it. I'm sure they will with YOU leading the charge- nasty old hootsuite! The TweetDeck support staff is slow in understanding this issue for some reason. Their response of "just don't tweet more than 140 characters" is simplistic. Before this change, we couldn't tweet more than 140; the tweet couldn't be sent. Now, we can all unknowingly tweet more and, as such, use Deck.ly. No one wants to be on guard when they tweet. A simple enable or disable feature is the only solid solution. Hope TweetDeck activates one soon! I went and left a comment at the link you gave. I do not see it posted though. I told them that simply telling us "not to type over 140 char and it will not be activated" is a lazy and cheesy way of not having to program a shut off option so we can shut it off ourselves. Not a fan of HootSuite, unfortunately. But, if TweetDeck doesn't fix this fast I bet a lot of users will jump ship. I agree, Adriel. It defeats the whole point of Twitter, doesn't it? TweetDeck is getting slammed today as people upgrade and realize there's no way to turn it off. There's always behind the scenes business going on, but users know what they like, don't they? I use the hashtags #Help #rescue #NY on the end of my adoptable NY tweets because I have a feed on my site that reads these hashtags. So when someone retweets my tweets the hashtags are exiled to the Deck.ly extension which means that my feed doesn't read it. So now I am forced to put these particular hashtags at the beginning of my adoptable tweets....UGH! In the now updated version of TweetDeck, you can finally disable Deck.ly. Unfortunately, the damage is already done. It's still there as the default and too many people have just gotten used to the extended tweets. In your case, with the hashtags, you're right. That does complicate matters. Such a silly and annoying "improvement" that Deck.ly thing is. UGH! Ha ha. Hey Rachel, thanks for commenting. There's a new version now (37.5) and you can go into settings and completely disable Deck.ly now. Thank goodness! That was driving me nuts! Thank you for allowing me to confess. Well, to each his own. As with most things, moderation is the key. I suppose it can come in handy here and there. Did you know that you can shorten your long urls with OUO and get money from every visit to your shortened urls.